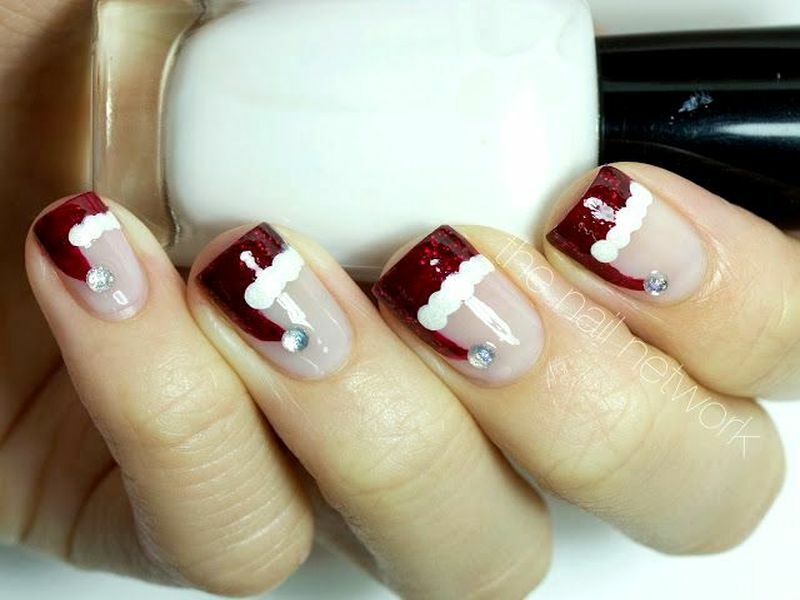 Who Wants To Get These Cute Santa Nail Arts? For the whole long month of the December, everyone gets prepared for the Christmas Eve. But at the last moment, other than finishing all the preparations; you must get some Christmas touch too! Having Christmas themed nail arts can do the best for this part. 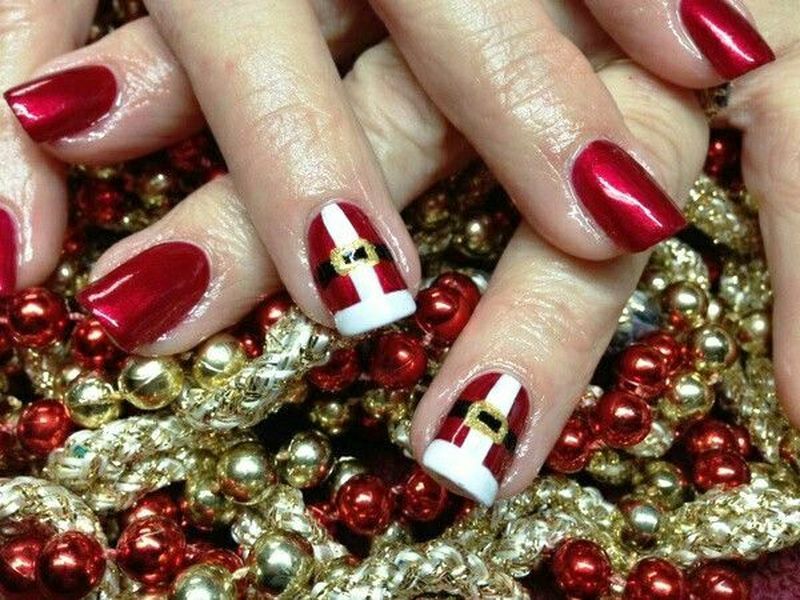 And the Christmas spirit will lead you to get these amazing Santa nail art! If you have already had a manicure, then don’t waste your time by taking it off and doing a new one at the last moment. But if you have been preparing to get your nail arts of Santa, then you have to prepare your nail polishes and the necessary tools to do it by yourself. 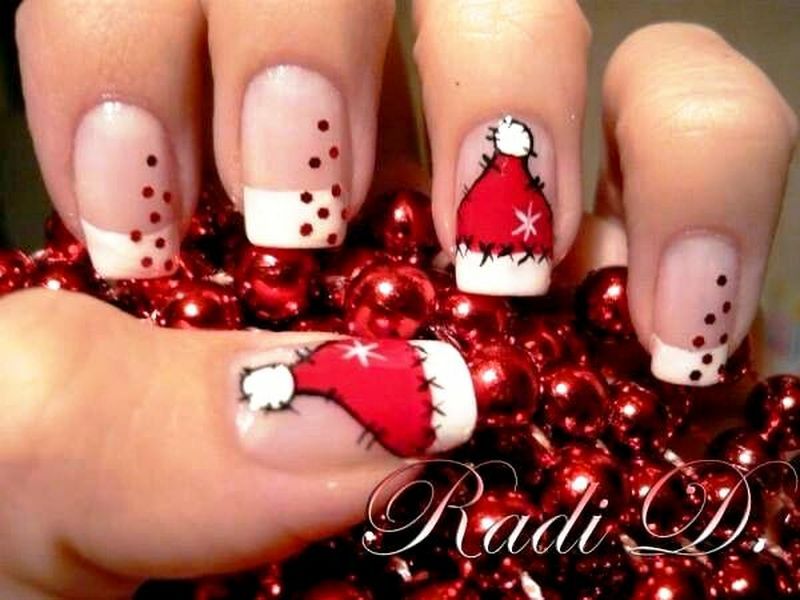 Regarding Santa nail arts, there are many different concepts which you can try one. At first, you can start with the face of the Santa. The chubby cheeks with white beard and shiny eyes with a smile on his face; that is all you have to do and it is really simple to start with! 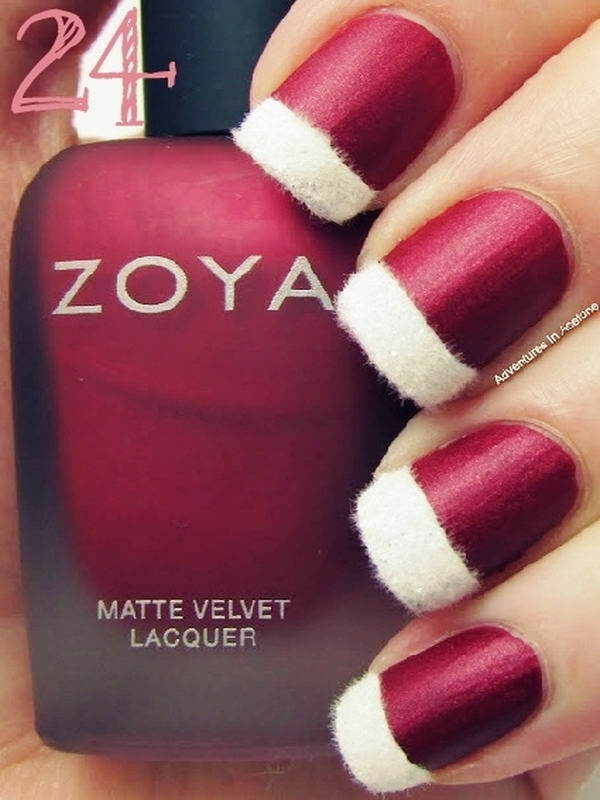 For a Santa face, you will need a red, black and white polish. Start with the hat with the red polish followed by white dots to make the shape of the hat and the beard. Apply a red little dot to make it as a nose and the black polish will be used to give the eyes. You can draw the face on all your nails or you can keep the face on one nail and draw different shapes on other nails. The colours should be all similar with red, black and white. You can draw the suit or the hat on the other nails to give him an overall body shape. 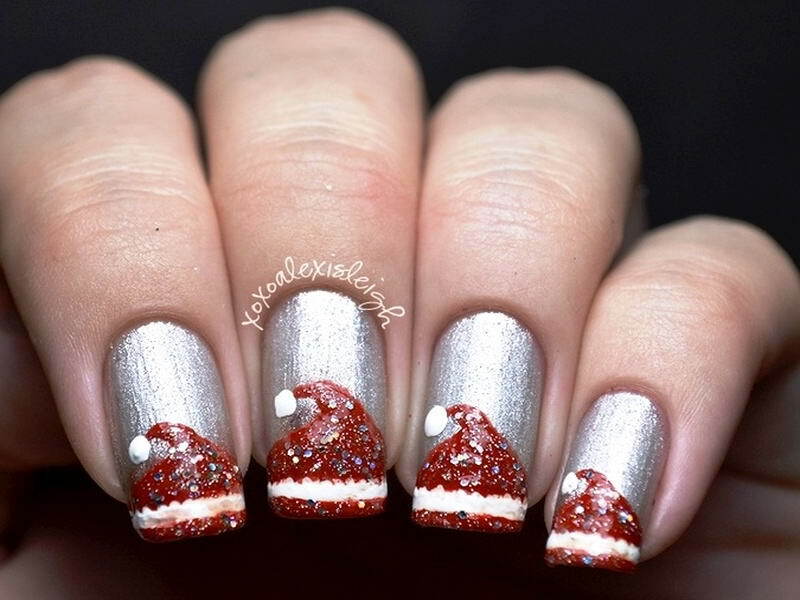 Next thing to try for a Santa nail arts is the hat! The red hat with a white border is really adorable and you can make the cutest one if you can draw it with a perfect shade and combination. For example, you can apply silver as the background to make the hat more realistic. 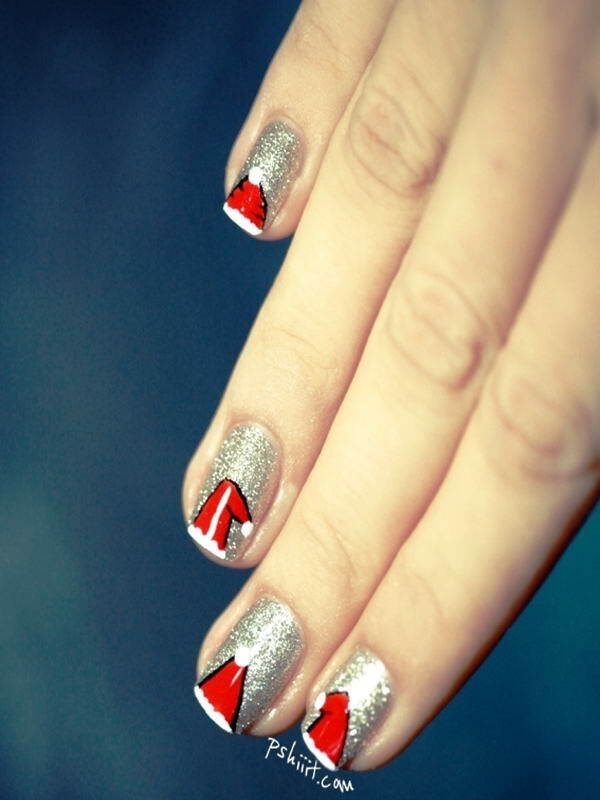 Apply red polish with your paint brush in a shape of triangle. Draw the white border with the white polish and apply black thin line around the red portion to daw the outline of the hat. You can give a white shade on the red portion to make the hat more creative! Using glitters or stones can also make the nail art gorgeous! Just don’t overdo it by keeping it simple and pretty. Another idea to draw to represent Santa is his awesome suit! 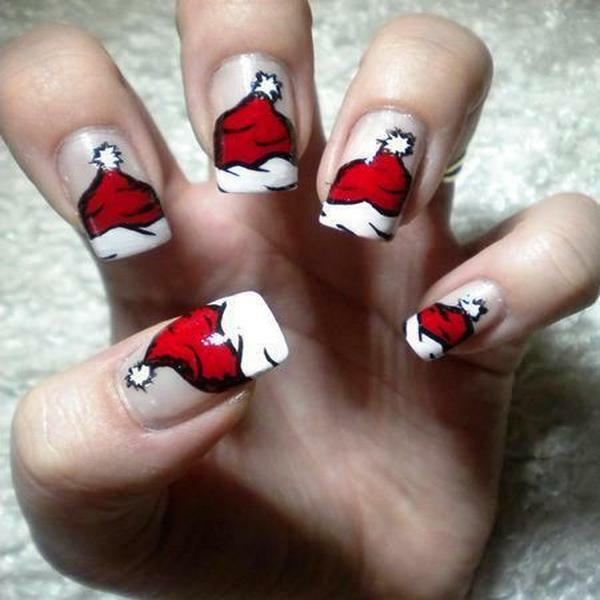 The red coat with white border and a black belt; that is all what you have to draw to have a Santa suit on your nails. For this nail art, you will need a red polish to be drawn on your nail as the background. Let it dry completely. Next, you have to take a paint brush and apply white polish as a ‘T’ shape to show the lining of the suit. You will need a steady hand to do this part. Next draw a single line in the middle to make the belt. Use a golden nail polish to draw the belt buckle. You can also use a glitter nail polish to make it a glossy one! 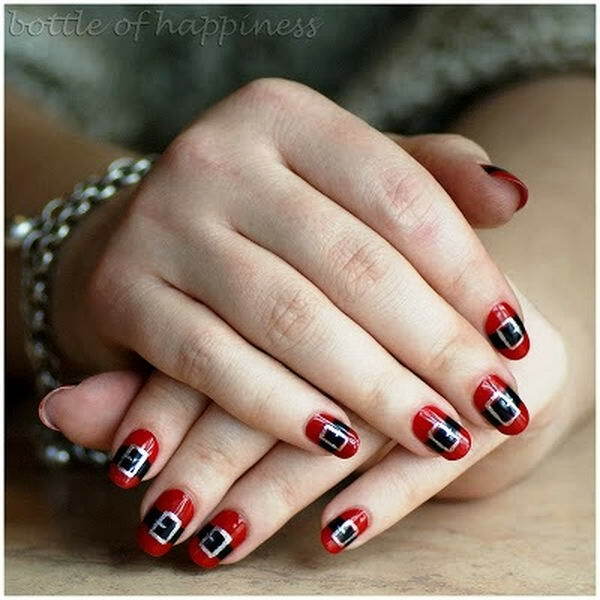 If you think you don’t have enough time to do all these, then you can simple grab the red and white polish and make a pattern and that will also be enough to show the Santa theme on your nails! In fact, red and white is what matters in the Christmas Eve, right? 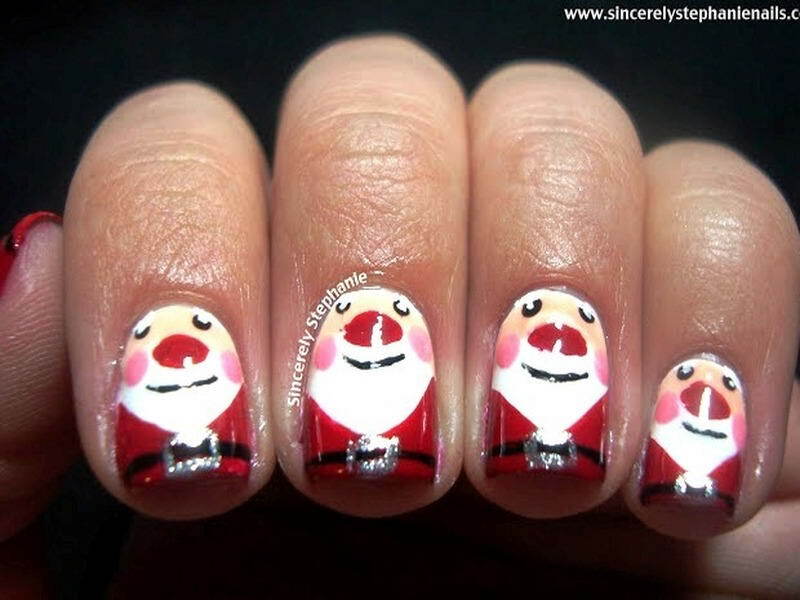 So which Santa nail art did you like most? Planning to do it tonight? 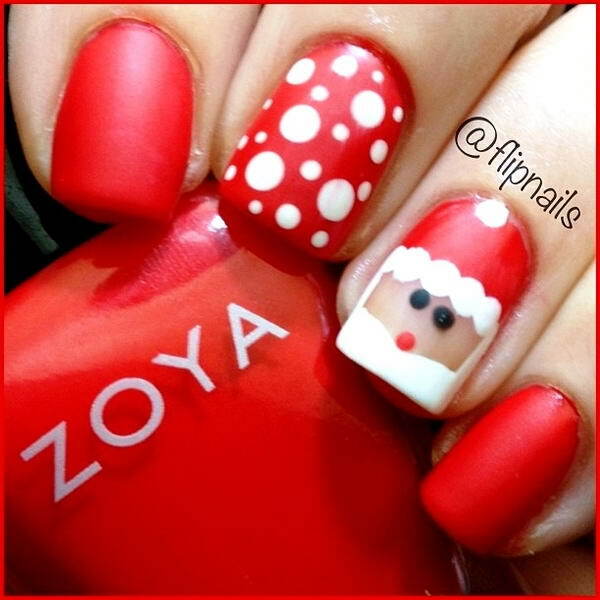 Get the best Santa nail art and make it the best Christmas ever!